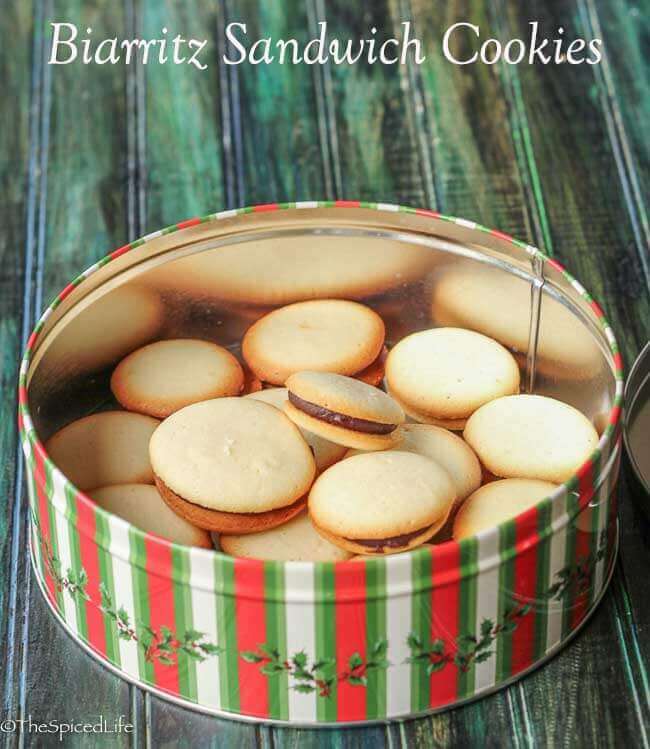 Biarritz Sandwich Cookies are delicious, elegant and easy French sandwich cookies that are perfect for holiday cookie tins, gifting or just for the heck of it! Affiliate links have been used to link to items I am discussing. 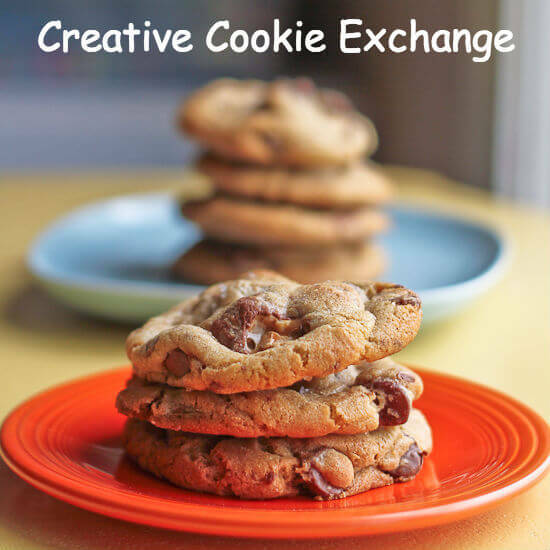 Keep reading to check out all the fabulous cookies with nuts that the Creative Cookie Exchange has for you this month. Raise your hand if you shamelessly adore Pepperidge Farm cookies, even though in general you eschew storebought sweets. Yeah, me too. The Milanos have always been my favorite–and someday I am going to make those. But as soon as I saw Dorie Greenspan had a recipe for the discontinued (but not forgotten!) Biarritz cookies in her new Dorie’s Cookies , I knew what I was making for this month’s Creative Cookie Exchange. 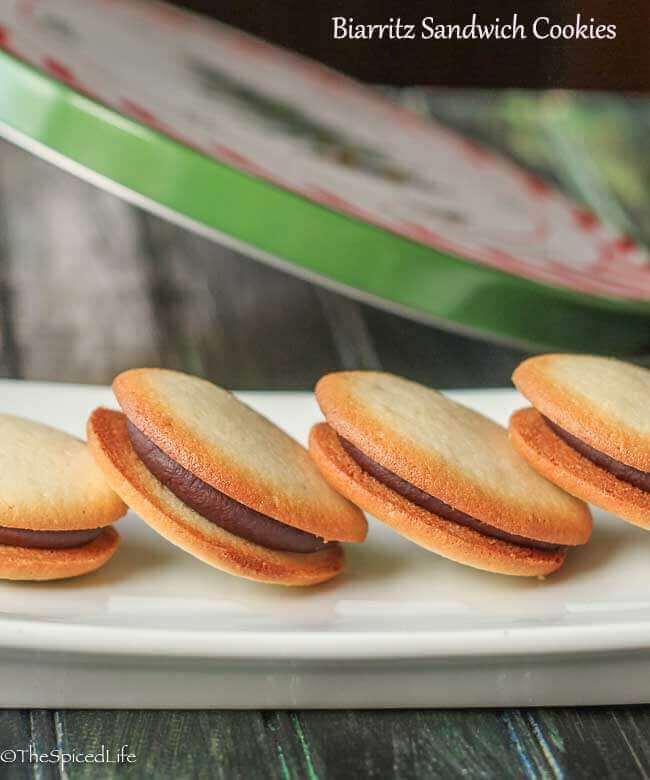 The Biarritz cookie is French in origin, and like many European sweets, it uses nut flour to add richness and structure as much as flavor. There is no almond extract in these cookies, and they do not taste particularly strongly of almond. Unlike their cousin the macaron, they are not chewy, but rather crispy, and they are much less sweet (a good thing, in my opinion). Make sure you use a fresh almond flour and good, fresh butter, because the cookie base of these sandwiches is not flavored in any way, not even with vanilla. 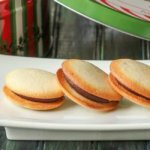 Biarritz Cookies can be dipped in chocolate ganache on one side, but I went with the option of making sandwich cookies, as I find that more festive for the holidays. These were simple to make (and once again, much easier than their cousin the macaron)–Sammy helped piped the cookies out and honestly most of hers came out fine, no matter how they looked when first piped out. In other words, don’t worry about getting them perfectly round. 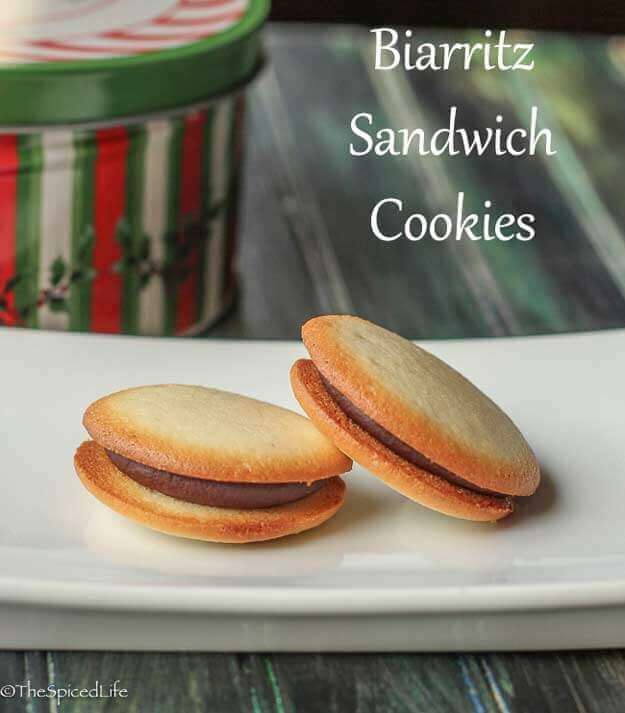 The Biarritz Sandwich Cookie has been a huge hit in this house–I have no doubt that next holiday season I will be hearing requests for them. Alex had been devotedly munching on Salted Chocolate Crisps, but she is now dividing her cookie devotion between the two, and Sammy has switched completely to these sandwich cookies. 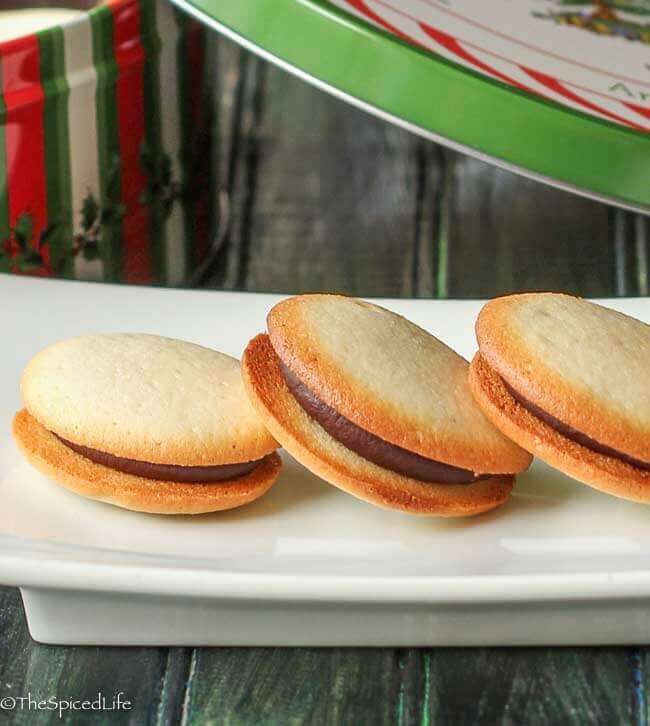 Note that the recipe as written makes about 20-24 sandwich cookies, so if you are making them for a cookie tin to last the season you might want to double the recipe (I have already warned my family in Ohio that I doubt any will be left to bring them–next time I will definitely double the recipe!). Closely adapted from Dorie Greenspan. Preheat the oven to 325 F. Line 2 cookie sheets with silicone mats (or parchment paper--Dorie Greenspan notes the silicones bakes a more even cookie and I found that to be true) and set aside. Place the almond flour, AP flour, confectioners' sugar and salt in a food processor. Blitz the processor to remove lumps, combine the ingredients, and get the almond flour especially as finely ground as possible. This was sufficient for me, but if you are concerned about your almond flour, also press the mixture through a fine sieve. Place the processed mixture into a large bowl. Mix the heavy cream, milk and butter together, and then pour into the processed mixture. Mix until a smooth but thick batter or dough forms. Set aside. Place the egg whites into a clean bowl or stand mixer bowl. Using either a hand mixer or stand mixer, beat the egg whites on medium high speed until they are foamy and beginning to whiten. With the mixer running, add the sugar in a slow stream. Beat until the egg whites are stiff. Scrape 1/3 of the egg whites onto the dough and mix vigorously--you want to lighten the dough. When it is incorporated, add the remaining egg whites. This time you will fold instead of stirring, but feel free to be a bit more vigorous than you might be usually with egg whites. They are going to deflate, which is ok, and you should end up with a smooth batter. Either attach a 1/2 inch tip to a decorating bag (I did not have that size tip) or cut off a 1/2-inch piece of the corner of a plastic bag. Place half of the batter into the bag. Pipe out mounds about the size of a quarter onto the cookie sheet, leaving 2 inches between cookies. When the first cookie sheet is ready, rap it briskly twice against the counter to help flatten and round the mounds. Bake for 19-22 minutes, turning from front to back halfway through. The cookies are done when they are firm and golden brown around the edges (do not remove before they have that golden brown rim). Let cool completely on the sheet. While the first sheet is cooling, go ahead and pipe out the second sheet of cookies and bake it too. Repeat if you need a third sheet (by then the cookies will probably be cool enough to remove from the first sheet). Let the cookies cool completely before beginning the ganache. Chop the bittersweet (we used 72% cacao) chocolate and place in a microwave safe bowl. Microwave on 30% power for 1-2 minutes. Add the heavy cream and stir, and microwave again for 30 seconds on 50% power. Stir. If there are any lumps left, you can microwave in very short bursts on low percentage power. It is better to stop with faint lumps and whisk them into the chocolate then overheat. When it is smooth, mix in the agave. Let the ganache cool for 5-10 minutes, so it is not super runny. You can use teaspoons, an offset spatula or a tiny cookie scoop (I used the last one), but when the ganache is a bit firmer, scoop a little round of ganache onto the bottom of one cookie, and then place another cookie, bottom side down (toward the ganache) on top of it. Do not press the cookies together firmly--the ganache will firm up completely and you will have a thicker filling that way, rather than risking it overflowing off of the cookie. Set aside to set--they need to set for at least an hour before placing in a tin (if your kitchen is especially warm or cold, this might need to be adjusted either direction). Nuts in cookies are a tradition celebrated all over the world–and Creative Cookie Exchange has joined the party! I love those Pepperidge Farm cookies too, it will be out little secret. And love the thought of making them at home. Just the idea of a crispy cookie with a rich chocolate filling (and the picture is definitely helping) is making my mouth water. Yum! Laura, these things look amazing!! I have been drooling over the book, and now I have another cookie to make!! Your cookies are perfection!!! Hi to Sammy!! The cookies look delicious! Sounds like I’m going to have to grab a copy of that book, sounds wonderful!